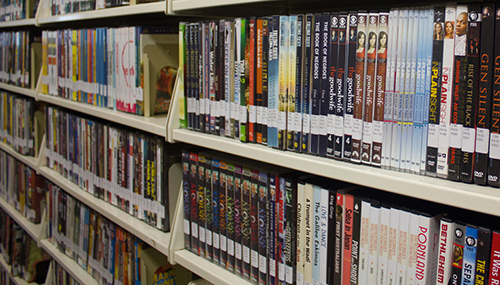 The Library Media collection contains over 9,900 DVDs and 9,000+ CDs on the 2nd floor of the library. You can check out these items (and Media reserves) at the Check Out Desk on the first floor. The Media Department also runs the Digital Media Lab (room 216H), where users can work on a variety of projects and loan A/V equipment. The Digital Media Lab (DML) provides all UMBC students, faculty and staff with access to audio and video recording equipment suitable for a variety of projects. The DML also provides recording spaces, specialized software, and equipment for in-house, self-serve use. All equipment and facilities are available on a first-come, first-served basis. These lists provide an overview of recent Media titles that may interest researchers in the various subject fields. They also provide recommended keywords for searching for similar videos in the catalog. Didn't find what you were looking for? Suggest an item for us to purchase! The Circulation Department details specific information about borrowing Media items, including loan periods, renewals, and late fines. At this page, you'll find a list of the streaming video databases subscribed to by the Library, as well as links to some free collections. Many of our 18,000 records can be searched in this database. Records can be checked out for a two-week rental. If you don't own a record player, a listening station is located near the Media Department. The Library Media Department offers individual and group work spaces, viewing stations for DVDs, Blu-rays, and PAL discs, and an audio station with record player. Remotes are attached to the equipment. The Screening Room (258) can hold up to 30 people, and features a Blu-ray/DVD player, Windows computer, HD Plasma TV, and VHS player. To reserve the Screening Room, please check the calendar for availability and fill out the form. Reservations are not required but do take precedence over walk-up appointments. A minimum of 3 people is required to use the room. You can check out the key at the Check Out desk. Showing a film to a group may require Public Performance Rights (PPR). While some of our films do have PPR, most do not. Please contact Library Media if you plan to screen one of our films for your club or student organization. Media reserves are submitted through UCORES. Titles should be submitted as soon as possible to ensure availability on the first day of classes. Professors who would like the library to purchase Media items for course reserve should complete a UCORES request with the title, director, etc. Faculty may book media items such as DVDs or CDs for in-class use by completing the Media Booking Form. Please submit your booking request at least one week prior to the date you need the item to ensure its availability, even if it’s on reserve for your course. Booked materials can be picked up at the Check Out desk. Regular circulating items will be placed on hold for you and loan for seven days. Reserve items not listed for your class, or reserves that are cross-listed, can only loan for the length of the class needed (unless prior arrangements have been made). The Department of Information Technology (DoIT) has announced that as of June 1, 2017, VHS players will no longer be available for classroom use. The AOK Library would like to address some of the questions and concerns that have been raised by this change.